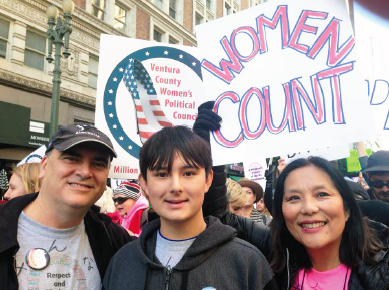 Vickie Ideta Allison participated in the Women’s March on Jan. 21 in Downtown Los Angeles with her husband and son. I marched because I am a patriot. I believe in the United States and the Constitution. I respect the office of the president. Donald Trump is my president. As a proud citizen, I vote, pay taxes, and march. I exercise my First Amendment rights of freedom of speech and to peaceably assemble. I marched to honor my parents and to prevent future acts of “race prejudice, war hysteria, and a failure of political leadership” like Executive Order 9066. During WWII, my U.S.-born Japanese American parents were unjustly evicted from their homes and interned. In 1988, President Reagan signed the Civil Liberties Act. The U.S. formally apologized and paid reparations of $20,000 to each camp survivor. Yet, I bear the historical shame and scars of internment. I have learned to be respectful, hard-working, educated, to keep my opinions to myself, unnoticed, and always silent. 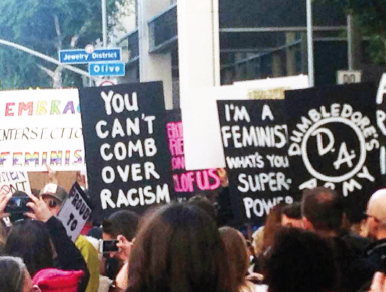 I marched because for 14 years, I have said, “That’s not OK!” when my child has shown disrespect or unkindness. When I watched Candidate Trump disparaging women, mocking people with disabilities, and spewing racist rants, I wanted to yell, “That’s not OK!” When I see parents at school mimic Candidate Trump’s disparaging actions and question why I can’t take a joke, I stare silently. Yet, my silence is not acceptance. I will continue to march. Patriotism requires setting aside your fears and fighting for your beliefs. The president of the United States is a role model for people here and abroad. Respect, kindness, equality, fairness are not partisan issues; they are acts that we expect from the youngest child. I march for others who are silent with the hope that we can be heard through our actions. Perhaps, in the crowd of 750,000, someone else also decided to set aside their fears and marched to show their patriotism.